The president of the tiny African nation of The Gambia has reportedly threatened to kill any homosexuals in his country, adding to his long-time record of cracking down on homosexuality. "If you do it [in The Gambia] I will slit your throat," President Yahya Jammeh said in a public speech in the Wolof language, cited by VICE News. "If you are a man and want to marry another man in this country and we catch you, no one will ever set eyes on you again, and no white person can do anything about it." He reportedly spoke in the town of Farafeni, while on an agriculural tour of his country. Jammeh's reference to "white people" was likely a nod to the European Union, which in December 2014 cut off some €13 million of humanitarian aid for The Gambia due to its poor human rights record. The only aid the African nation is receiving now comes from Middle Eastern states. 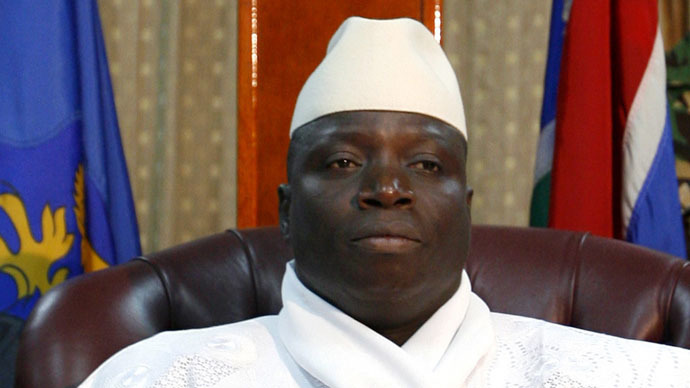 The EU's aid freeze came after in November, Jammeh signed a law on "aggravated homosexualism". It introduced life imprisonment for homosexual men and women who are sentenced for repeating the "offence", or who are HIV-positive or sick with AIDS. Homosexuality was outlawed in the country even before that, punishable by up to 14 years behind bars. This is by far not the first time Jammeh has lashed out at homosexuals. Last February, he called them "vermin" and vowed to fight them "like malaria-causing mosquitoes". And back in 2008, he advised them to flee the Gambia, saying he would otherwise chop their heads off. Yahya Jammeh, who came to power in the 1.9-million strong nation through a 1996 coup, survived an overthrow attempt himself in December 2014. The alleged conspirators, two of whom are US citizens, wanted"to restore democracy to the Gambia and to improve the lives of its people,"according to the US Department of Justice. Jammeh is known not only for his crusade on homosexuality and crackdown on freedom of speech, but also for some rather extravagant statements. These include putting the blame for his aunt's 1999 death on "sorcerers," and Jammeh's 2007 claims he could cure HIV/AIDS with herbs.